Frog design has the privilege of working alongside Fortune 100 clients to address the most complex and important design challenges that will shape our collective future. 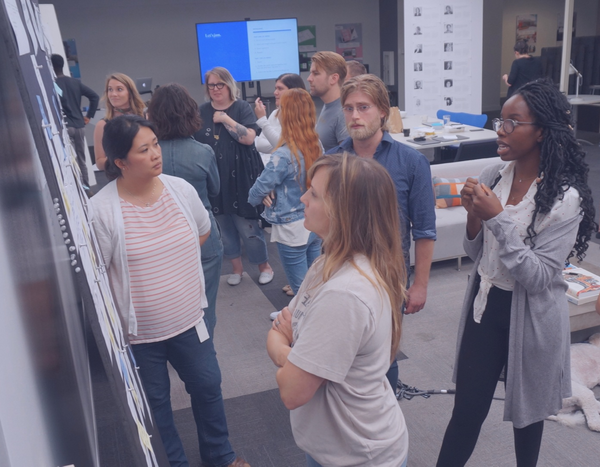 Frog’s Executive Technology Director, Jona Moore, found herself in boardrooms with some of the most brilliant female leaders in technology and design and gathered a team of frogs to interview these women about their careers and leadership styles. The insights are synthesized into an immersive experience that honors each woman’s story and highlights the struggles and strategies that women face as they ascend in their careers. This work has become the foundation of our ongoing conversations around redesigning outdated workplace structures and environments to better serve a modern, inclusive workforce. During this event, attendees will experience the landscape of challenges that adversely affect female workers through a series of interactive exhibits. Attendees will uncover strategies that these women used to accelerate their careers and understand the unique ways women lead creative teams. Then, frog docents will lead attendees in a small group activity that will help us challenge assumptions and imagine new paths for the next generation of women leaders.